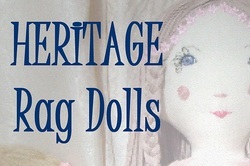 All my Heritage Rag Dolls are made from cotton, linens, wools, calicoes, hollow-fibre stuffing, with wool, ribbon hair and such.... the clothes are cotton, linen, tweed, silk, satin, with ribbons and braiding. Each one is different and individual with hand embroidered eyes, nose, lips and cheeks. The clothes are stitched on, hand embroidered embellished. The seams are double stitched and over-locked, the limbs are set in stitched and firmly stuffed with fibre that compiles with fire regulations (1988) and measure 19" or 48cm in height. I use new and vintage cottons, fabrics and lace, with embroidery cottons and silks ensuring everything is securely stitched in to place. I would suggest they are suitable for over 3's to adult collectors, but suitable as gift only for babies - ie decorative.... I hand embroider the name and date of making (their 'birth-date') onto the back of the doll and give a Certificate of their 'birth' with the details of the clothing they are wearing and such. Each one is an individual and unique, and can be personalised to suit your specific requirements, making a special gift for yourself or loved ones. - or collected by adults where I can add further personalisation with embellishment of embroidery, sequins and beading on request. Tula Mae was created on 29th January, 2014. Her name and date are hand embroidered onto her back and has her very own certificate to give you all her details and personal information. She has Blonde hair, made from the finest 3 ply, palest cream, wool. She has a cute fringe, long hair with thick bunches tied with Grey satin bows. Tula wears a grey satin/silky dress with a drop-waist in 'Flapper' style, edged with vintage cream lace, grey silky ribbon and vintage cream bow to the back. Underneath her dress her bloomers are in white cotton with deep lace edging in delicate pink and white. Her shoes are from the same grey satin/silk as her dress with matching bow to tie. On her wrist Tula wears a vintage lace bracelet with silky cream rose hand-stitched on. Tula Mae is my own design and individually, hand-made by myself, she has curved arms for hugging and shaped feet. Her eyes are hand embroidered in the finest stitches in open style, with dark brown threads and lashes, her iris is a peacock blue, her pupils are black with a white French Knot to give life and character to her face. 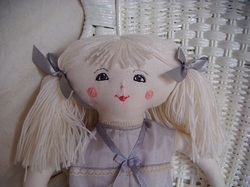 Her peachy nose and cheeks are carefully hand embroidered, with her lips stitched from shiny rose silk threads. 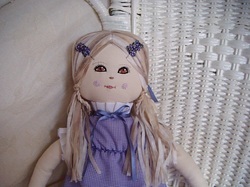 Tula Mae, is a Heritage Rag Doll and is made from cotton calico, satin, silks, hollow-fibre stuffing, with wool, ribbons and lace. Phillipa Jaye was created on 28th January, 2014. Her name and date are hand embroidered onto her back and has her very own certificate to give you all her details and personal information. She has Blonde, Beige highlighted hair, made from the sheerest ribbon ply, palest cream to brown variegated, wool. She has a centre parting, long hair with sweet ringlets to her face, stitched hairline with fancy braiding hair-slide, she has a twist braid tied to the back with a purple silky ribbon. Phillipa Jaye wears a purple tiny gingham dress in cotton, with purple smoking with Herringbone Stitch, a lacy trim embroidered with Coral stitch in fine purple threads. Her dress is edged at the hem, neck and arms with vintage white cream - pleat trimming with a smart purple silky ribbon detail to her bodice. Underneath her dress her bloomers are in white cotton with fine lace edging in delicate white. Her shoes are from the same small gingham cotton that are laced with purple cotton threads and a French Knot to each side. On her wrist Phillipa holds a white vintage lace posy with silky purple rose hand-stitched on. 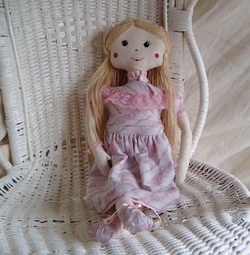 Phillipa Jaye is my own design and individually, hand-made by myself, she has curved arms for hugging and turned feet. Her eyes are hand embroidered in the finest stitches in open style, with dark brown threads and lashes, her iris is a light hazel-brown, her pupils are black with a white French Knot to give life and character to her face; eyebrows are pale and light. Her mocha nose and violet pink cheeks are carefully hand embroidered, with her lips stitched from dusky pink cotton threads. Phillipa Jaye, is a Heritage Rag Doll and is made from cotton calico, satin, silks, hollow-fibre stuffing, with wool, ribbons and lace. Sadie Rose was created on 30th January, 2014. Her name and date are hand embroidered onto her back and has her very own certificate to give you all her details and personal information. She has Mocha Blonde hair, made from the softest ribbon ply, wool. She has a centre parting, long hair with side plaits dressed to her face with pink rosebuds. Her stitched hairline holds her long hair in place, and is perfect for styling and plaiting. Her crown has a flowered hairband embroidered in place with an individual chain stitch to the centre of each flower. Sadie Rose wears a pink pin tucked dress in soft mute satin, with cream vintage lacy trim with ribbon embellished bows to each side. Her full length dress is edged with vintage lace to the neck, arms, bodice, hem and centre frill. Underneath her dress are frilly knickers in double white lace layers, individually stitched. Her boots are from the same pink mute satin that are tied with pink ribbon threads and a a bow to the front. Sadie holds a single a pink rosebud matching her hair decoration, securely stitched to he detailed fingers. 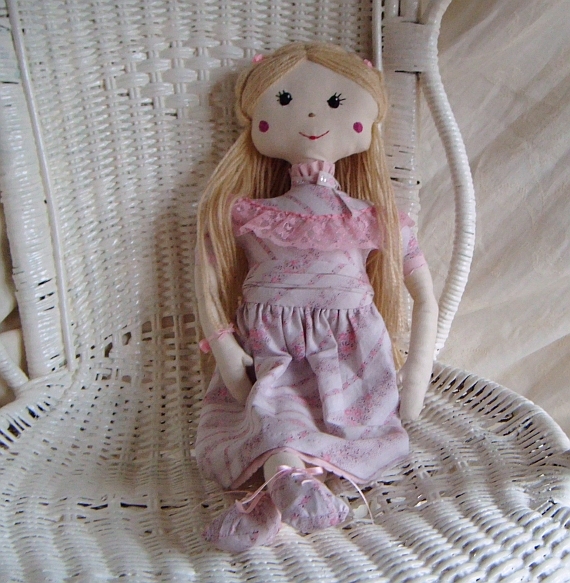 Sadie Rose is my own design and individually, hand-made by myself, she has curved arms for hugging and shaped feet. Her almond eyes are hand embroidered in the finest double coloured Dark Blue and Sky Blue stitches, with black threads and Curly Lashes from Glistening Vintage Black thread. A white French Knot stitch gives life and personality to her face. 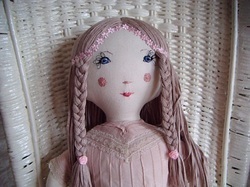 Her mocha pink nose and cheeks are carefully hand embroidered, with her lips stitched from Coral Pink cotton threads. Sadie Rose, is a Heritage Rag Doll and is made from cotton calico, satin, silks, hollow-fibre stuffing, with wool, ribbons and lace. Jola Louise was created on 27th January, 2014. Her name and date are hand embroidered onto her back and has her very own certificate to give you all her details and personal information. She has Corn Blonde hair, made from the softest double ply, wool. She has a centre parting, long hair with side pony's tied high upon her head and dressed with pink rosette roses. Her stitched hairline holds her long hair in place, and is perfect for styling and plaiting. Jola Louise wears a pink flowered dress in soft cotton, with a pink lacy trim embroidered with Herringbone Stitch in fine pink threads. Her dress is edged at the hem, neck and arms with vintage pink scalloped trimming with a rose ribbon bow to the neck. She wears a cummerbund in the same fabrics delicately gathered to the sides with Candy Pink lace trim detail to her bodice and shoulders. Underneath her dress her bloomers are in the same cotton as her skirt with the same pink scalloped edging. Her shoes are from the same pink cotton that are laced with pink ribbon threads and a tied with a bow to the front. On her wrist Jola wears a pink rose corsage, securely stitched and ready for her party. Jola Louise is my own design and individually, hand-made by myself, she has curved arms for hugging and turned feet. Her eyes are hand embroidered in the finest stitches in character style, with black threads and lashes. A white French Knot stitch gives life and personality to her face. Her mocha nose and cerise pink cheeks are carefully hand embroidered, with her lips stitched from bright rose pink cotton threads. Jola Louise, is a Heritage Rag Doll and is made from cotton calico, satin, silks, hollow-fibre stuffing, with wool, ribbons and lace.